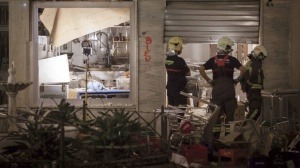 Up to 90 people were injured, 4 of them seriously, after a gas explosion in the kitchen of a cafe in the center of Velez-Malaga. One of the cookers noticed the fire in the kitchen and alerted all the customers to leave the place as soon as possible. This has prevented more injuries of serious consequences. Firefighters were able to access into the local and remove the remaining gas bottles to prevent further explosions while the street was closed to the public. – Activation systems must not involve any risk to people. – They must allow a speedy recovery in activity after his performance. – Easy installation, maintenance and integration with cooking equipment. – Components of the installation must be safe against food and water. – Allow the fulfillment of the law and the protection of life and property.